VMware, Oracle, Cloud in Ravello? It is not very often that I get to talk or write about VMware related technologies within Oracle, other than Customer purchasing our Oracle X86 based servers for their VMware farms or some workshops I have run in the past for our ZFS customers (VM troubleshooting with dTrace is excellent!). Even more rarely, does this event crossover span into a cloud-based discussion too. That is not to say that there aren’t any joint solutions out there in the field, (there are thousands of deployments globally with Oracle and VMware serving a joint purpose of providing a solid storage\computer\virtualisation solution for our customers). But today is that day! If you are a virtualization nut, you might have heard of Ravello from way back, I remember first using it a few years ago under the vExpert NFR program and ironically, this blog post centres around my vExpert account that I continue to use. Ravello is a lovely picturesque resort town set 365 meters above the Tyrrhenian Sea on Italy’s Amalfi Coast……. Kidding!, Ravello Systems started up back in 2011 by Benny Schnaider and Rami Tamir who created the KVM hypervisor at Qumranet (which is now part of Red Hat) and raised $10 million dollars in their first venture capital round. Their objective was not to recreate lightning in a bottle or add another layer of abstraction between hardware and software much like the KVM hypervisor, but rather than virtualizing and partitioning the hardware for multiple stacks to use it at the same time (cloud? ), and act somewhat as a facilitator of communication between separate computers. Along came Oracle and at the beginning of 2016, acquired Ravello Systems with the intent to run VMware/KVM development, test and demo environments in the cloud without migration. The business case for this requirement is huge, why waste precious resources (labour, infrastructure, software) on something that you only need every now and then and is not business critical. Let’s be fair, these sorts of environments are no doubt virtualised and running on VMware vSphere so the target became “Running VMware workloads on public clouds – without any changes” and form part of our Lift and Shift cloud journey at Oracle. The Ravello import tool gives the user the capability to clone their entire VMware environment which could be running on Amazon Web Services, Azure or Google Cloud Platform and shift it to the Oracle Public Cloud. It had cloud written on it since the beginning! 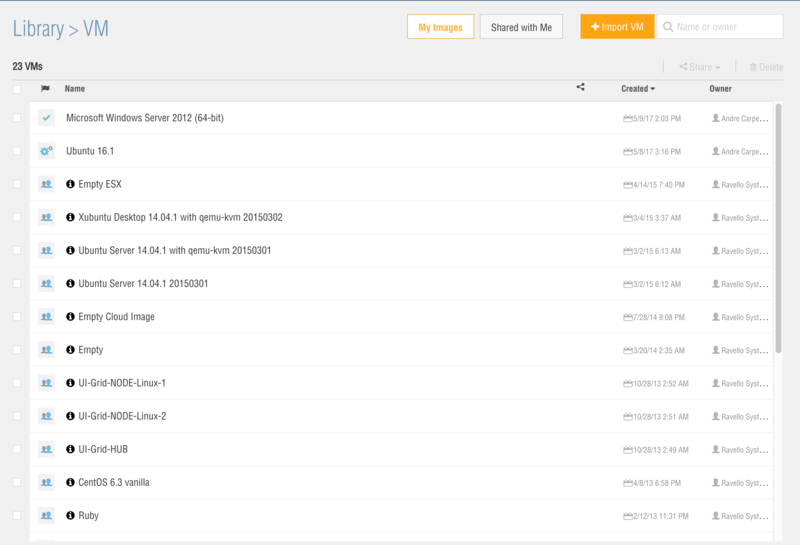 This is the default view and provides a list of all of your published cloud applications, which you can drill into to find which VM’s are running to support that application. Below is the VM library, of which I can create multiple applications from using these as somewhat of a template. You can see from the owner down the right-hand side that Ravello has pre-populated some templates to use (with predefined configuration options) and that I have also uploaded a few in order to build out my application stacks. Sharing is caring so you can even share your VMs or disk images on the Ravello Repo to collaborate with others, however, you must have a public profile before you can share or use library items on Ravello Repo. If you make changes to your shared VM or Disk Images in your library, they will be automatically updated to the version that is visible to other users. This is probably where the platform sells itself, the various canvas views provide an excellent glance over what your Ravello environment looks like from high up, you can see which ports are exposed to the public (internet) and which are internal as well as resource configurations on the right hand side. 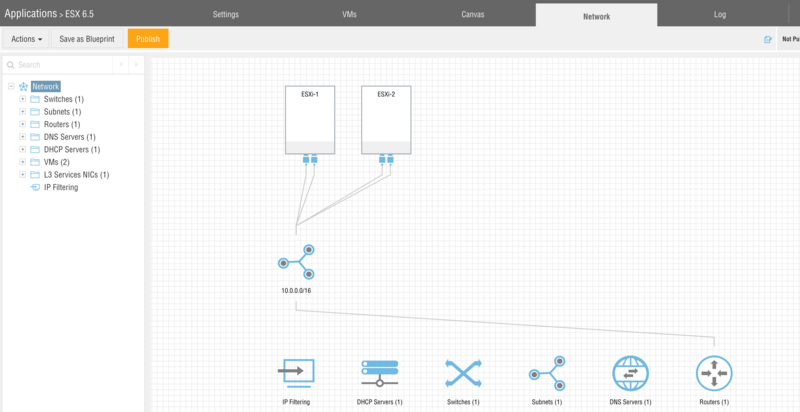 On the Network Canvas (shown below), you can quickly connect your applications to various network-based services (DHCP, Proxy, DNS etc) quickly and easily by clicking and dragging connection points between each other. Users only pay per hour of use and there are no upfront commitments so you can cancel when you need to. So easy! I 1CPU, 1GB storage and 1GB RAM will set you back about 43 cents an hour (AUD), or approx $315 Australian dollars a month. A lot cheaper than space, power and tin in a data centre. Keen to learn more?, head over to https://cloud.oracle.com/en_US/tryit to try it for yourself for free or wait for my next post on creating and publishing applications in the Ravello Cloud!